Two quick updates regarding the Mega Man: Fully Charged cartoon today. 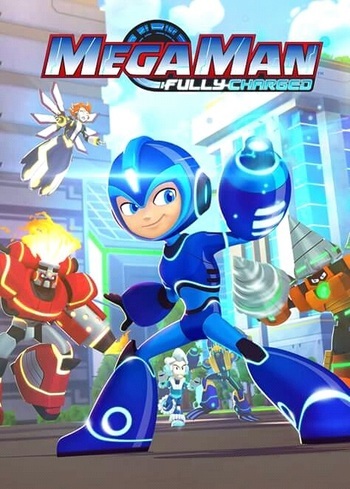 First up is the bit of news I've been eagerly anticipating, what with being in Canada and all, and that's the release date for Mega Man: Fully Charged in Canada! According to I Miss Bionix (via Protodude's Rockman Corner), the show will be coming home to the country what birthed it on Saturday, September 8th, when it will air on the Family Chrgd channel at 8:30am -- way better than Cartoon Network's "is the sun even up yet?" timeslot of 6:30am the following day. If that wasn't enough, while there's no word of on-demand viewings, there will be an encore presentation at 12:40pm that same day, with another new episode arriving on Sunday in the same time slots. I Miss Bionix says that both listings are half an hour, which despite the latter timeslot being off of the norm by ten minutes, seems to follow Family's normal practices. Episode 11, September 9: Unfriendly Competition - Aki must set aside a petty rivalry with Bert Wily in order to stop Chemistry Man from wreaking havoc at Silicon Central's Field Day. Episode 12, September 9: Opposites Attract - Fire Man and Wave Man team up to evaporate the city's water supply, forcing Mega Man to team up with an ally of his own-Suna. Episode 13, September 16: I.C.E. (In Case of Emergency) - When Ice Man decides to be a hero, Mega Man, influenced by Ice Man's literalness, steps down from the hero biz until a true crisis snaps him out of it. Episode 14, September 16: Trust Your Guts, Man! - Guts Man tries to undo Dr. Light's eco-friendly disposal of trash in Silicon City by infiltrating the family and destroying the Lighthouse so he can eat it! Episode 15, September 23: Drill of the Hunt - Mega Man tries a quick fix using Hypno Woman's powers to rehabilitate Drill Man, to disastrous results! Episode 16, September 23: Power Cycle - After replicating Elec Man's powers, an underslept/overcharged Mega Man goes on a 24/7 hero spree that ends up turning him into his own worst enemy. Episode 17, September 30: Bored to Be Wild - Mega Man teams up with his crush, Ashley Adderley, to solve a series of science riddles left by Chemical Man, who's plotting to turn all the city's metal into rubber. Episode 18, September 30: Enter the Wood Man - Mega Man accidentally awakens Wood Man, who thinks it's still the Hard Age, sets off on a path of destruction toward Silicon City. Mega Man: Fully Charged debuted on Cartoon Network on Sunday, August 5th at 6:30am EST, and is also be available on the Cartoon Network app. Included above are the air dates for the Cartoon Network broadcasts.